Flooring plays a vital role in the interior décor of any room or living space in a home. While it can completely transform the look of a space, choosing between flooring options is quite daunting – and rightly so. With endless varieties, finishes, and types available, narrowing down choices can be especially hard. However, if you’re looking for something that’s durable, economical, and offers great design versatility, vinyl flooring is the way to go. Today, we’ll be talking about vinyl flooring pros and vinyl flooring cleaning tips to help you make an informed flooring decision. One of the least expensive, but most popular flooring options available in the market, vinyl flooring is the synthetic version of linoleum. Made from 100 percent plastic, it is flexible, non-porous, and can be easily installed via an adhesive backing. Vinyl flooring is available either in a sheet form, where the sheets are 6 or 12 feet wide, or in tile or plank form. The most common are the inlay vinyl tiles which have multiple layers of vinyl coverings fused together in a pattern. These inlay tiles are more durable in that they are able to withstand more wear and tear. The pattern and colors of the vinyl are retained, even if a few tops layers are worn off. Another type of vinyl tile is the rotogravure tile. Though considerably cheaper than the inlay version, this type of vinyl flooring is only comprised of a thin top layer of vinyl covered by a protective coating. Other types of vinyl tiles include printed or fiberglass reinforced versions. You wouldn’t think so, but there are more vinyl flooring pros than you can count. However, today we’re only covering the most important ones. Flooring options are not exactly cheap, especially if you’re looking to change the flooring of your entire home. As such, if you, as a homeowner, are opting to make such a hefty investment, the major concern for you would be the durability and longevity of your investment. One of the top vinyl flooring pros – the one that makes this flooring option so popular – is the fact that it is highly durable. Vinyl, a synthetically made product, is quite sturdy, which has the potential to last for as long as twenty years or more, given that it’s properly cared for. All vinyl versions are specifically made to be highly durable and resistant to damage. Vinyl floorings are a fantastic choice irrespective of what part of the home you are considering it for. Available in a wide range of styles, colors, designs, thickness, and patterns, vinyl flooring is adaptable to almost every type of interior décor. Its diversity also makes vinyl a good option to be used anywhere in the home, from the bathroom, to the living room, kitchen, bedrooms and beyond. Vinyl floorings are completely waterproof – the water simply beads on the surface instead of penetrating through the floor. This makes vinyl flooring the best material for bathrooms and kitchens, especially those on the upper floors because it helps prevent seepage to the floor below. Vinyl floorings, especially the printed type, have an additional protective layer on top which acts as a barrier against stains and spills. Its high durability and wear and water resistance makes vinyl flooring a particular easy option to care for. There’s no long-list of products or techniques needed to clean or maintain the vinyl floor when a good mopping and regular dusting can do the job. Unlike ceramic, marble, or wood tile floorings, vinyl has a soft texture beneath. As a resilient, plastic material, it does not get cold and remains comfortable to step on even in the dead of the winter. That’s not all; vinyl sheets can be supplemented with a padded under layer to emphasize its comfortableness even further. Whether it is sheets, tiles, or planks, vinyl flooring is easy and quick to install. All vinyl types are self-adhesive in that they come with ‘peel and stick’ backings. All you have to do is to literally peel off the protective covering at the back and carefully stick the vinyl in place on a dry and isolated subfloor. Vinyl flooring makes for a fantastic DIY project; however, it is recommended that you opt for professional help during installation to ensure its longevity. Due to the fact that vinyl is synthetically mass produced, its cost per square foot remains significantly low, despite its high demand and popularity. Even the highest quality, premium vinyl products aren’t anywhere near as expensive as other flooring options, like wood, marble or stone. We’d go as far as to say that vinyl flooring would cost a fraction of the total cost of a stone flooring. Vinyl flooring pros are aplenty. It can withstand a lot of wear and tear, abuse, and high traffic over a very long period. However, vinyl, like every other flooring option, still needs some TLC to help maintain its pristine condition through the years. Regularly clean the vinyl flooring. Even the most durable of materials need to be cleaned every so often. Develop the habit of doing a gentle sweep with a dry broom just to pick up the dirt and debris before it has a chance to set in. Use a damp mop and some mild shampoo to clean the grime, sticky spills, and hairspray buildup off the floor every week or so. It is recommended that you wipe off any food spills right away to minimize the chances of stains. 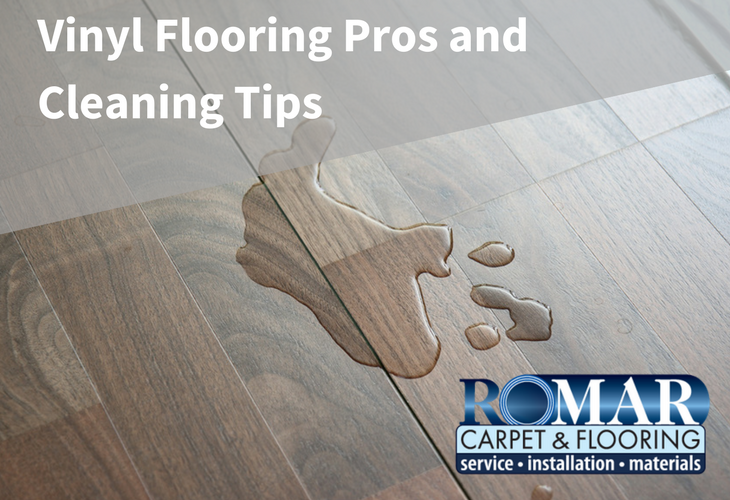 Avoid drenching the vinyl – it is water resistant for the most part yes, but a consistent puddle will eventually make its way through the edges or cracks beneath the vinyl, causing considerable damage to the subfloor. Use specific vinyl cleaners only. Either take recommendations from a professional installer, or pick up products that are specific to your particular type of vinyl. Waxes, soaps and other cleaners can and do leave unwanted buildable residue atop the surface. Use furniture protector pads beneath heavy furniture. Vinyl is a relatively soft material prone to indentation under heavier weights. Wide furniture protectors help prevent the indentation marks as do rugs. So, what do you think? Have we convinced you about investing in vinyl flooring yet? Armed with all this new information about vinyl flooring, the many vinyl flooring pros and cleaning tips, we’re certain you’ll make the best decision for you and your home. However, if you still have any queries or concerns, don’t be shy about reaching out to us – we’d be more than happy to help you in any way we can. Share your thoughts with us in the comments below. And if you really like the information, do share it with your friends and family.